Provo and Orem Personal Trainer | Your Fitness Quest: Which Body Fat Testing Method is Best? Which Body Fat Testing Method is Best? Knowing how much you weigh can be beneficial, but knowing your body fat percentage is even more enlightening. The Body Mass Index (BMI) is a tool developed for large populations to determine levels of obesity, but only frame size and weight were factored into the equation. As a result a bodybuilder with 7% body fat may show up on the BMI index as being obese. Knowing your body composition is important for anyone who is trying to maintain a healthy weight. Body fat can be measured in a variety of ways. Some are more affordable than others, some are more convenient, and other methods offer greater accuracy. Here's a summary of your options. Skin calipers-Calipers are used to measure the thickness of various fat locations on the body and then these measurements are plugged into an equation to determine your body fat percentage. It is relatively accurate but there is great possibility of human error if the technician taking the measurements is unskilled or inconsistent. Some people don't like to have their fat manually pulled out and measured with a gauge either. 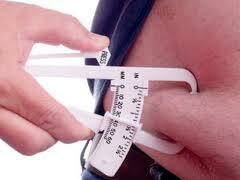 ﻿﻿Bio-electrical Impedance-These are common in gyms or on body fat scales. Your body fat percentage is estimated by how long it takes a very small electrical charge to pass through your body. The electrical impulse travels faster through muscle than it does through fat. These are quick and convenient, but usually not as accurate since the charge may just arc through the upper or lower body and as a result may not give you a complete picture of your overall fat. Hydration levels can also skew the results. Hydrostatic Weighing-This is an older method that uses Archimedes principles of water displacement. You will probably only find these at a University since they are so large and expensive. You sit in a dunking chair and blow all the air out of your lungs as you are slowly lowered into a small pool of water. You then have to hold still as long as you can. The water displacement is measured to help determine your body fat. It is a difficult process and uncomfortable for the test subject, but very accurate. ﻿﻿ The Bod Pod-The Bod Pod looks like Mork's egg spaceship. It is a small chamber that uses the same displacement principles previously discussed, but instead of water it uses air. You just hold still once inside for about a minute while it calculates your body fat. It is very accurate, comfortable, and easy to use. The disadvantage is that you may not like it if you are claustrophobic and they are not very common at gyms since the machine is quite pricey. Dexa Scanning (Dual Energy X-Ray Absortiometry)-This tool was originally developed to analyze bone density. It is basically a bed you lie on as an X-ray slowly scans your body. It is slow but very accurate. It is also extremely expensive. Not only does it tell you what your body fat % is but it's detailed analysis breaks down exactly how much fat is located throughout the body and can break it down by torso, arms, legs, etc. I prefer bio-electrical impedance devices since they are so quick and easy and can still give you a decent idea of your body fat, but when I want to get a more accurate measurement, I will splurge and spend the $15 bucks to have the calculations made with a bod pod. Focusing on one's body fat percentage is more telling than just worrying about what the scale says. Remember fat is not necessarily bad, your body needs a certain amount to be healthy. Unfortunately most Americans have exceeded the healthy level and have put themselves at a greater health risk for a variety of diseases.